Osmanthus heterophyllus is a separate species of osmanthus. Osmanthus heterophyllus is an evergreen flowering shrub or tree related to the olive tree. It is variously known as false holly or holly osmanthus, as the prickly young leaves resemble holly. As the leathery, dark green leaves mature, they become less spiny and older leaves are often softly serrated or even entirely smooth. Osmanthus heterophyllus is a compact, medium-sized hedging plant particularly suitable for borders and low hedges. The strongly scented flowers attract bees and other insects from June through to October. 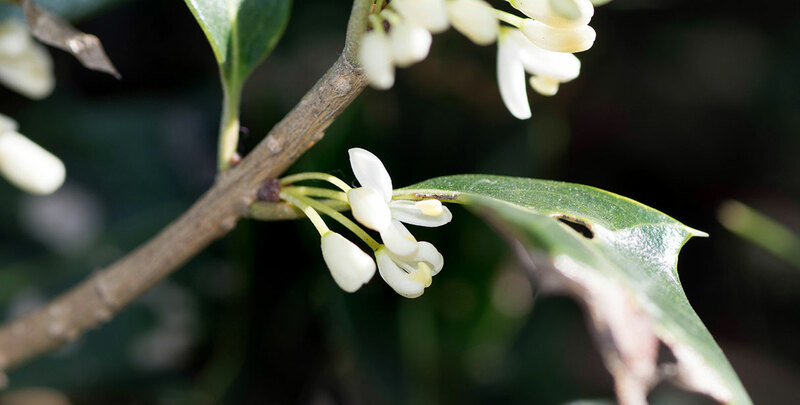 Osmanthus heterophyllus requires a fertile, well-drained soil to thrive. Exposed locations are best avoided and the same applies to shady sites. Full sun and partial shade are the most suitable. Osmanthus heterophyllus is a slow to average growing species (20-30cm p.a.) and, as such, little pruning is needed other than to shape or remove unwanted branches. Remember to leave as many of the fragrant flowers as possible. Osmanthus heterophyllus is fairly hardy and can handle mild winters.